This last Friday I ran my first 5k with a time around 27:40 0:27:29.0 (I can’t seem to find my official time anywhere online I placed 272nd out of a field of 345 or 66th out of 75 for my division). Not too shabby considering I hadn’t ran 3.2 miles in forever and that I rode my bike a bit over 4 miles to get to the race, which wasn’t my wisest decision as of late. At any rate, the run felt great and we had a great time at Norm’s after the race. Maybe by the end of the summer I’ll do something crazy like a half marathon or a sprint triathlon. 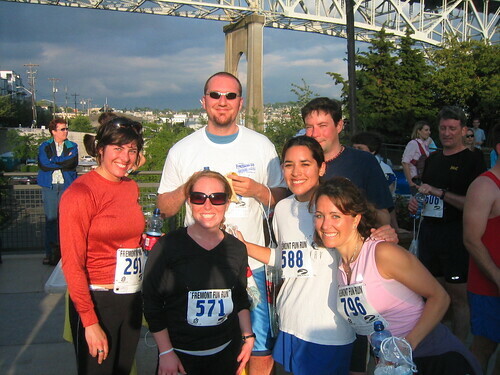 This entry was posted in fremont, running, seattle by joestump. Bookmark the permalink. Who the hell is that guy with facial hair and a shaved head. I don’t even know you anymore. Congrats man! I really need to try and find the time to get in shape. Glad to hear you are being active, I’ll drink a beer to that. Oh and on a side note, why are your RSS feeds not working…or is it just me? You ran a 5K? Are you sure you aren’t confused? 6 minute K’s are just a brisk walking pace aren’t they? I would think with the long legs that you have you would have been able to at least run…uh…walked a K in a little less time. Well….The best part is….You did it. keep doing it. It’s good for you. Seriously…A great big congrats!!!!!!!!! Oh…One more question…What age division did you run in? Uh…AARP?? ?